At a meeting on Thursday 29 September Councillors will consider a private report on two potential locations for the Great Tapestry of Scotland visitor centre – Tweedbank and Galashiels. The opportunity to consider an alternative development in central Galashiels only came about earlier this summer. Buildings have now become available that were not vacant or available when we carried out the original assessment of potential sites. The report will be considered in private due to the inclusion of commercially sensitive information, which must be put before Councillors as part of the decision-making process. Elected members will hear that both the previously identified Tweedbank site, opposite Tweedbank Railway Station, and a town centre site in Galashiels are viable options for the siting of the visitor centre. “We are proposing that we proceed to look in further detail at the Galashiels option as this may attract further additional funding that the Tweedbank project could not access and it would also act as a significant town centre regeneration project. “Siting the visitor centre in Galashiels town centre would have the potential to unlock substantial benefits for the town, including transforming it into a true visitor destination, which could encourage further positive developments in the town over a number of years. “The report before Members demonstrates that both sites are viable and that the Tweedbank site has a very strong business case. If councillors agree to proceed in line with the recommendation a further report will be brought back before them in November, setting out more project details, including potential phasing, and also confirm the potential funding sources for the project. 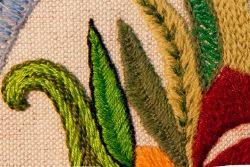 The Great Tapestry of Scotland is a joint project with the Scottish Government. The Government is committing up to £2.5million towards the project’s delivery and we have agreed to spend up to £3.5m. The Great Tapestry of Scotland is a unique community arts project to stitch the entire story of Scotland. It was the brainchild of renowned writer Alexander McCall-Smith, historian Alistair Moffat and artist Andrew Crummy. The Great Tapestry initially went on display at the Scottish Parliament, before touring around the country. The exhibition of the Tapestry in the Verdant Works in Dundee has been credited with quadrupling visitor numbers to the museum on the same period last year, with the venue taking on additional staff to cope with the increased numbers. The Great Tapestry of Scotland is 143 metres long and has 160 panels. It was created by more than 1,000 volunteer stitchers who spent in excess of 50,000 hours on the Tapestry.